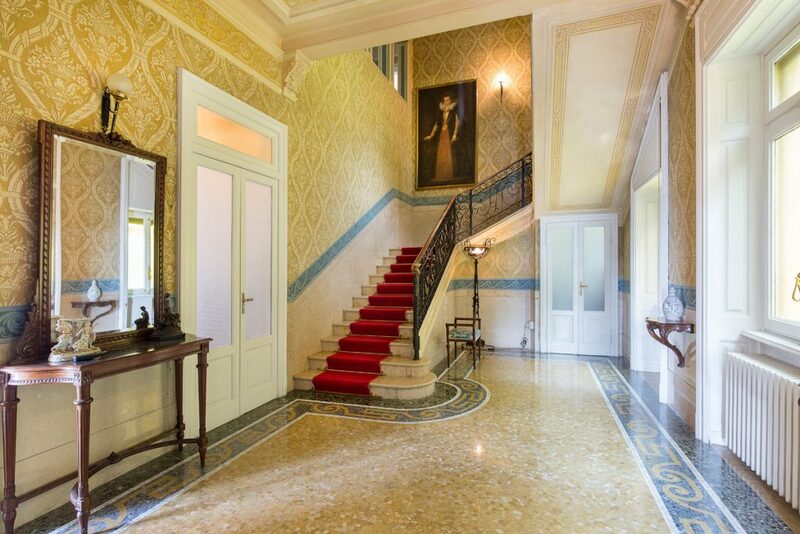 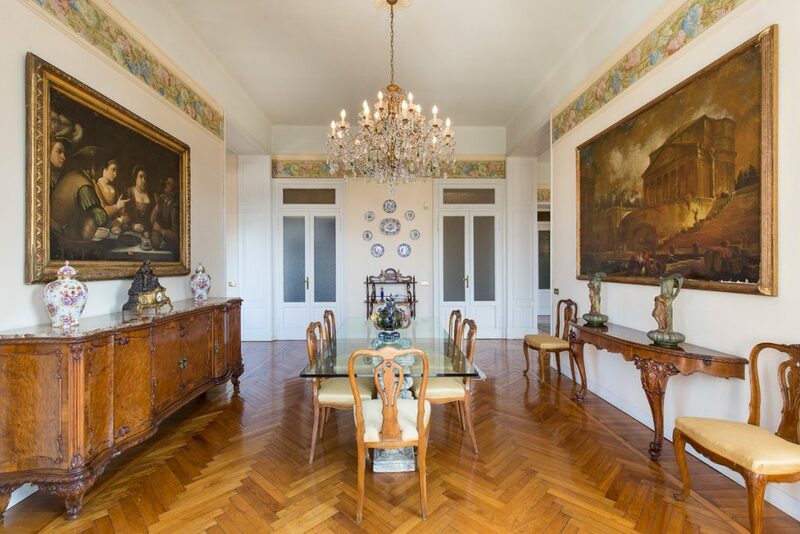 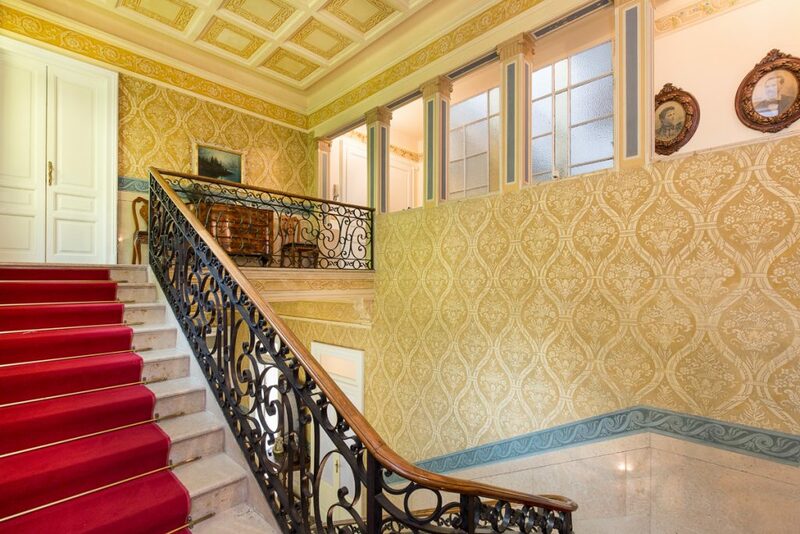 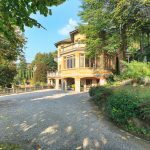 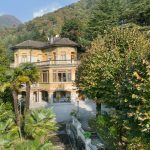 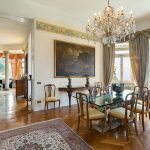 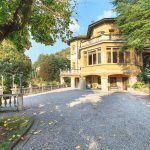 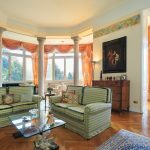 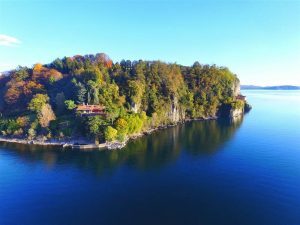 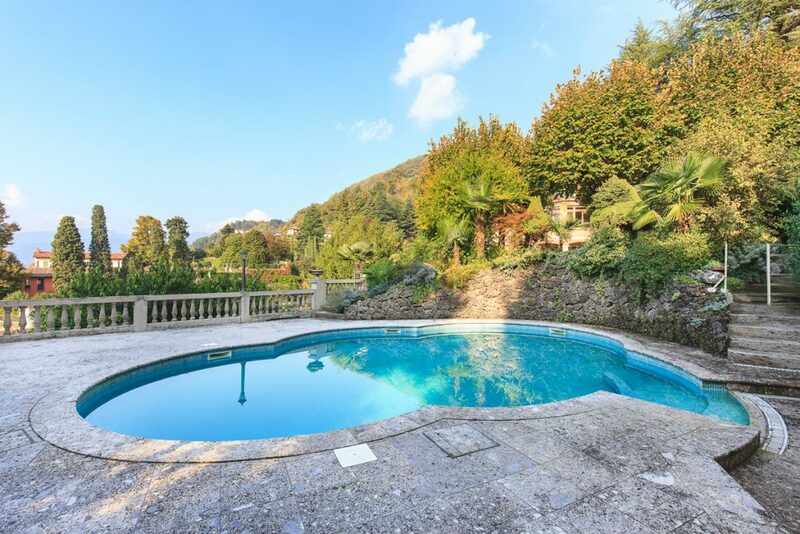 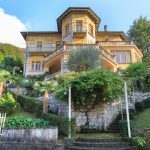 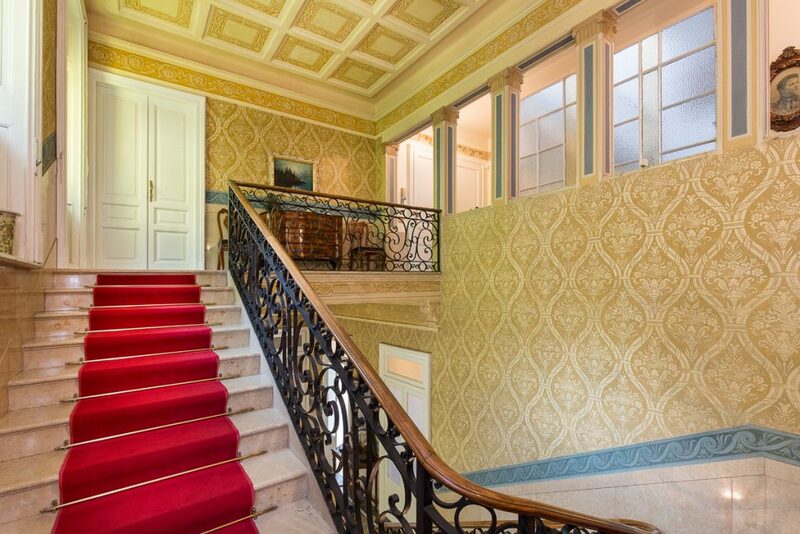 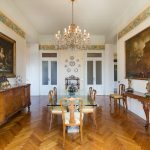 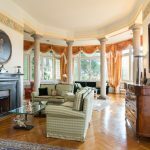 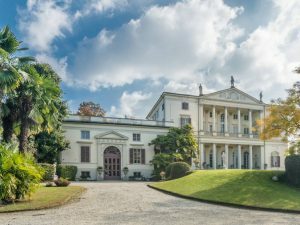 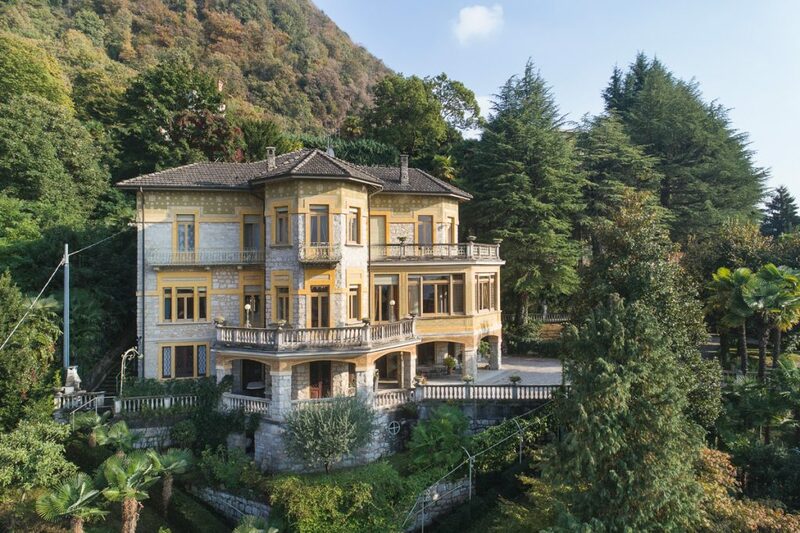 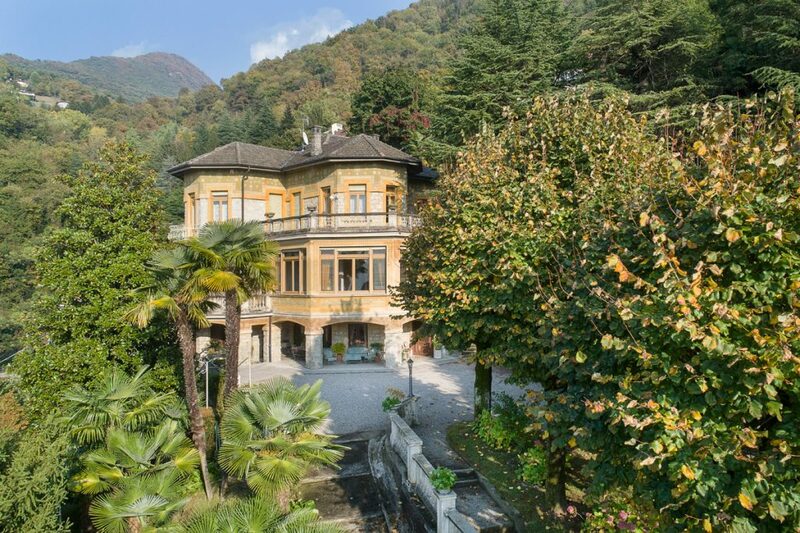 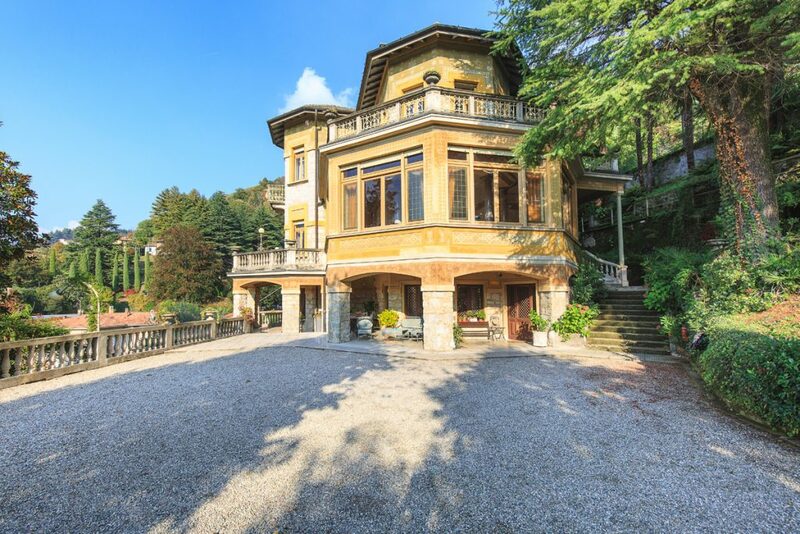 Prestigious period VILLA FOR SALE on THE SHORES OF LAKE MAGGIORE. 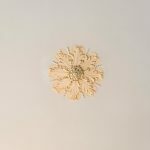 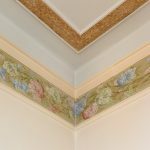 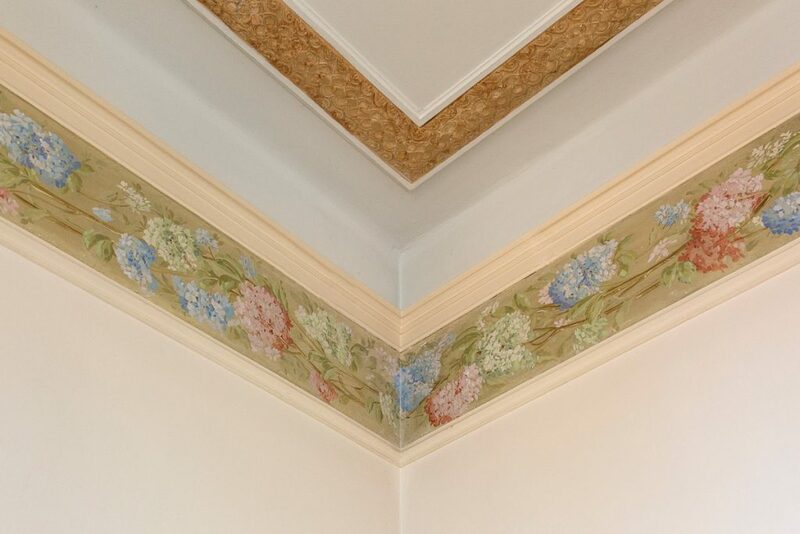 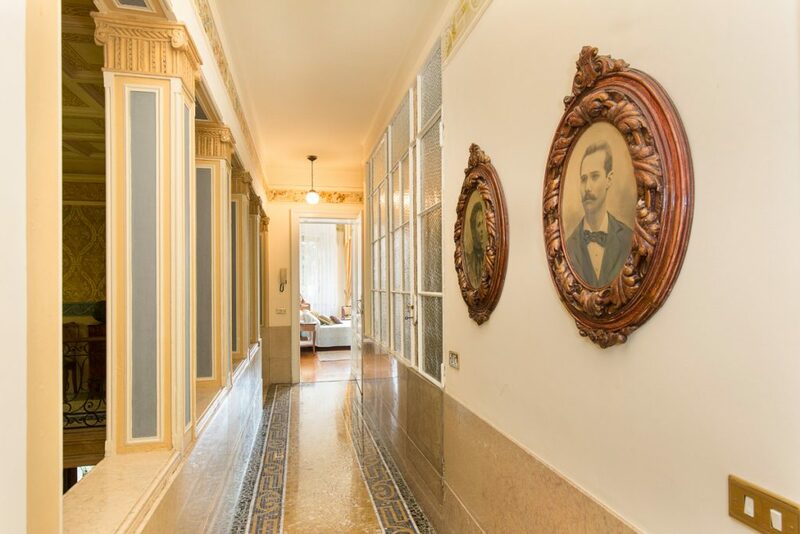 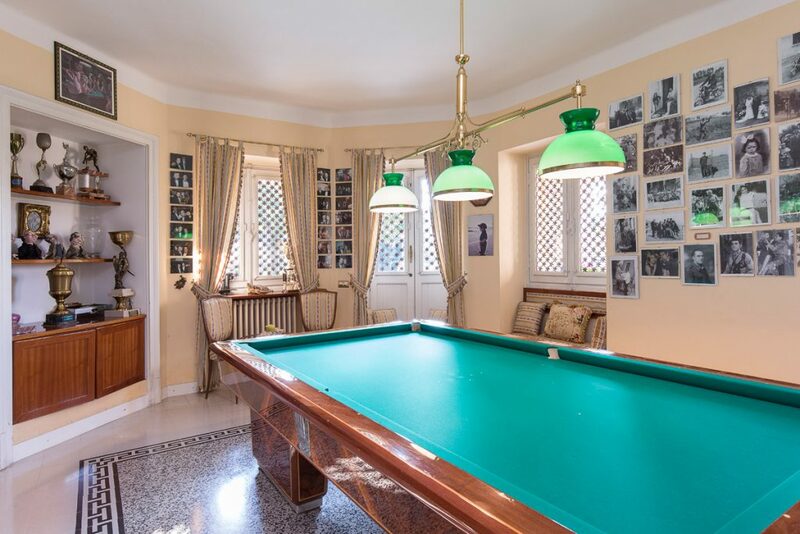 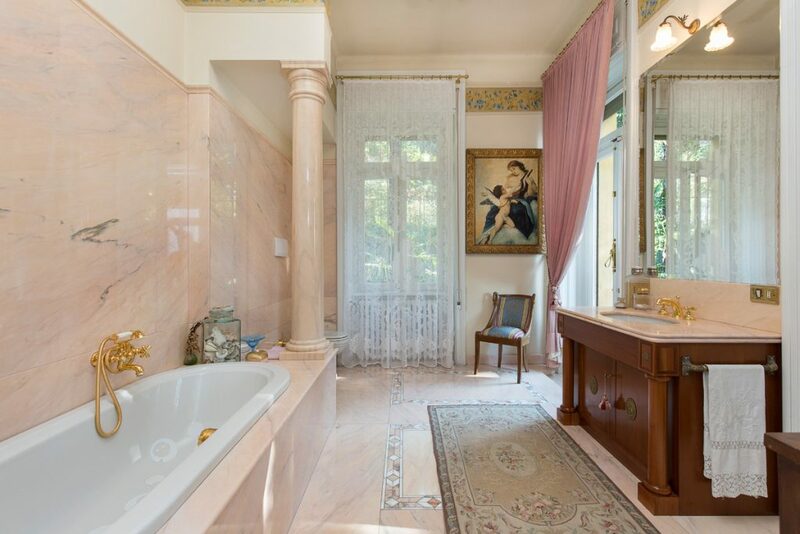 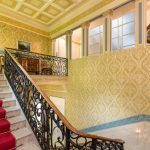 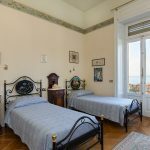 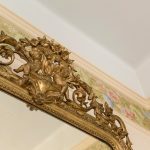 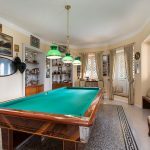 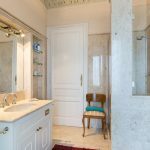 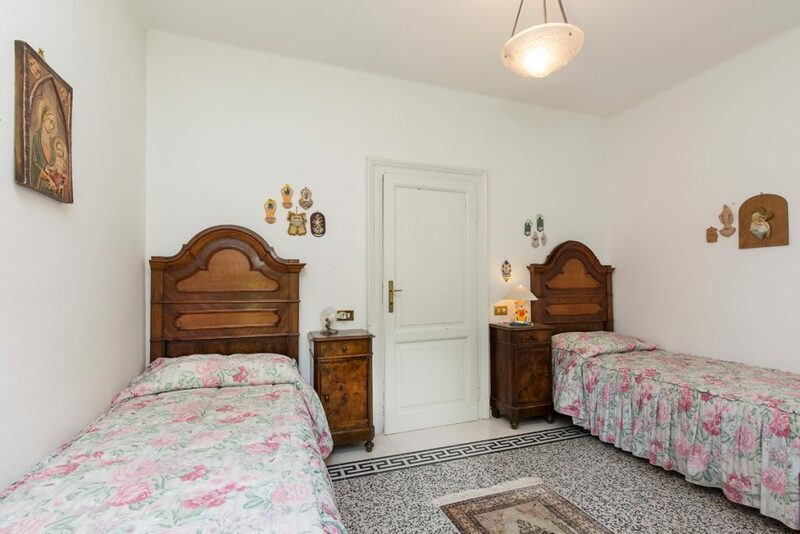 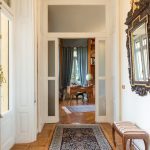 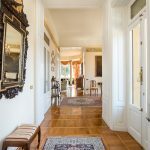 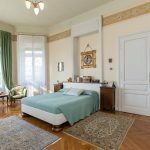 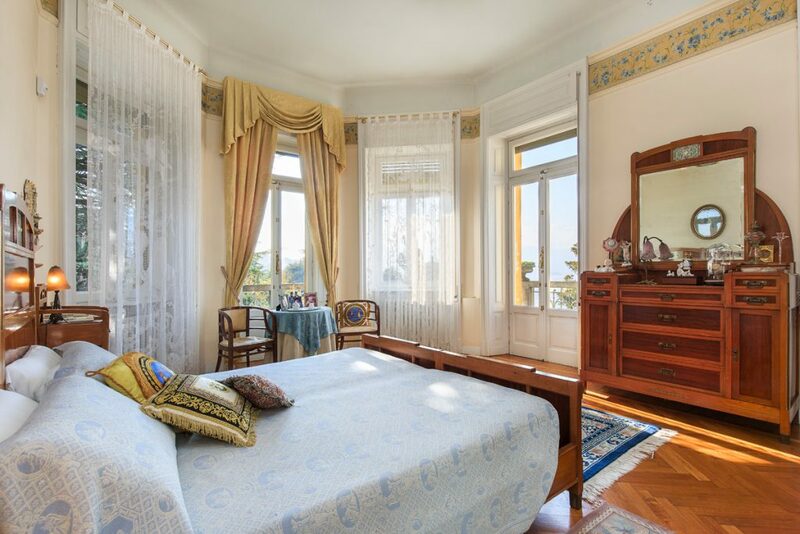 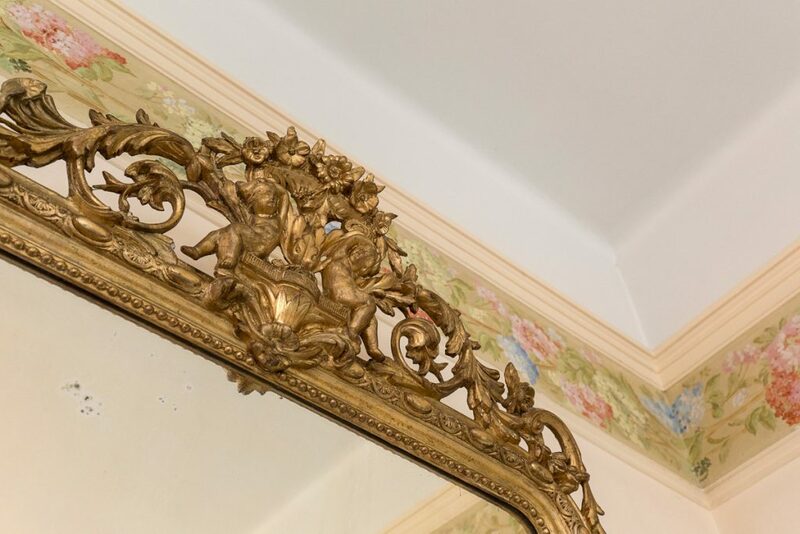 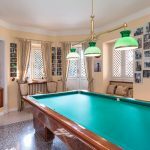 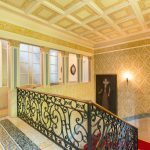 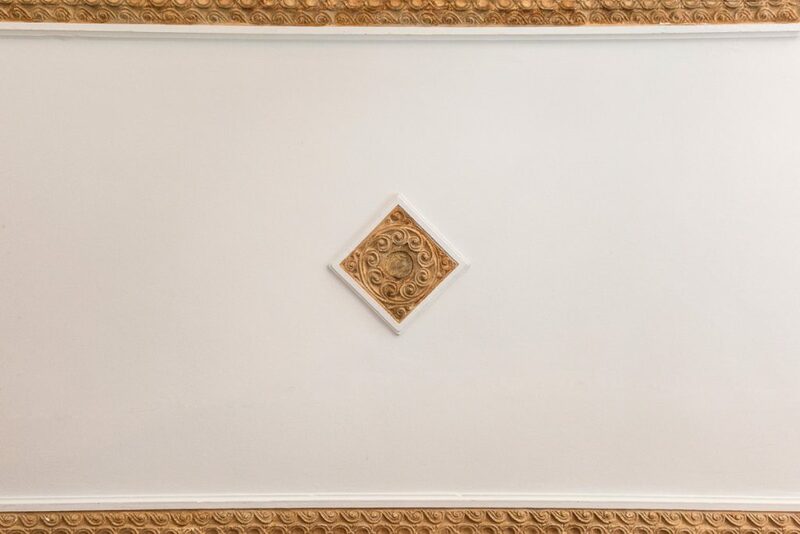 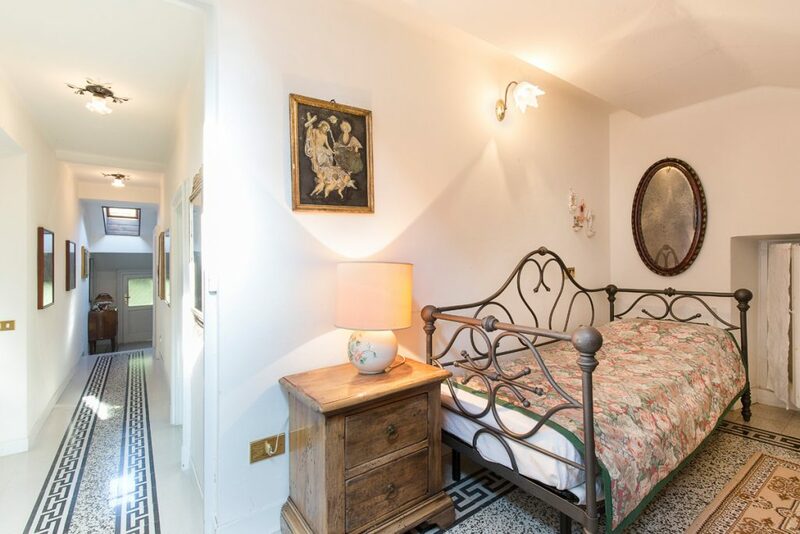 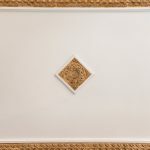 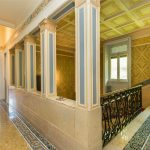 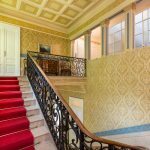 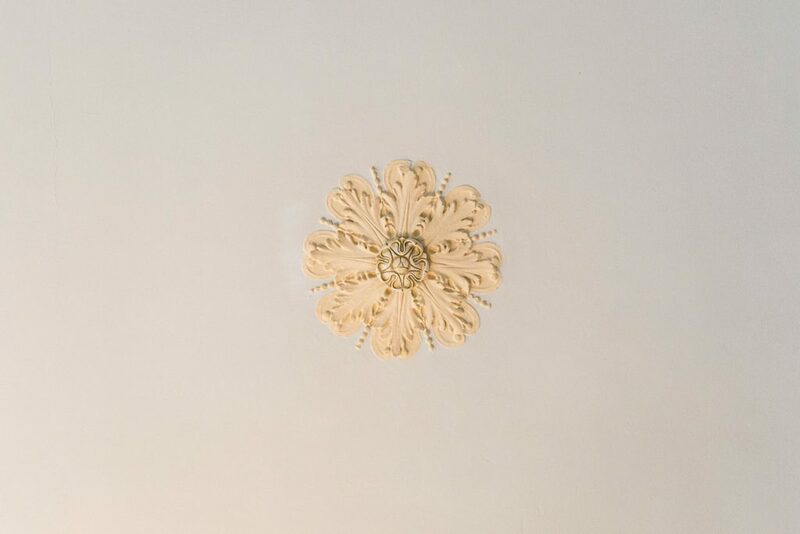 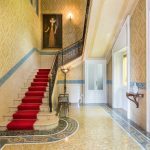 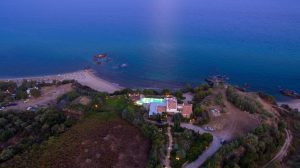 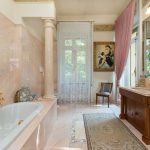 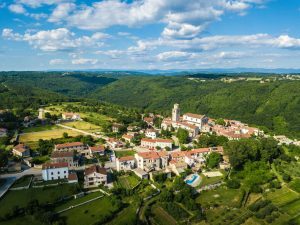 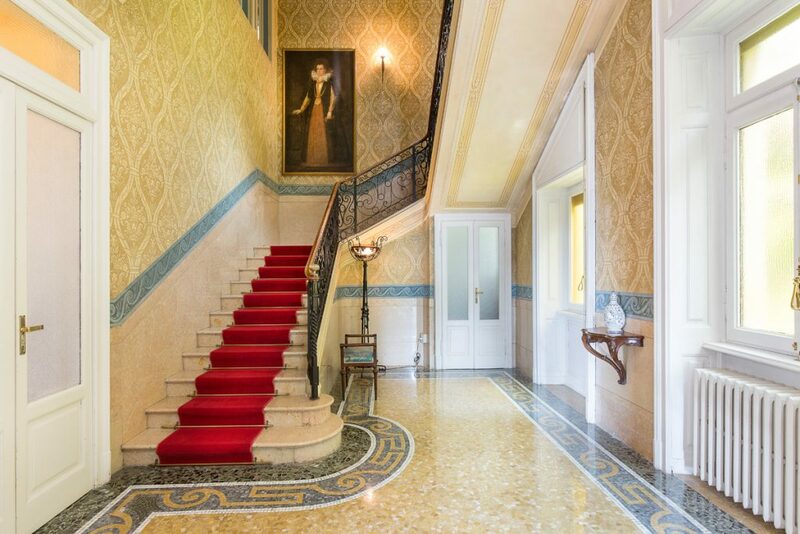 The villa dates back to the early 1900s and was restored with high-quality materials, keeping its Art-Nouveau charm intact and grand architectural heritage, such as decorated walls and frescoes ceilings, precious mosaic and wooden floors and decorative plaster moldings. 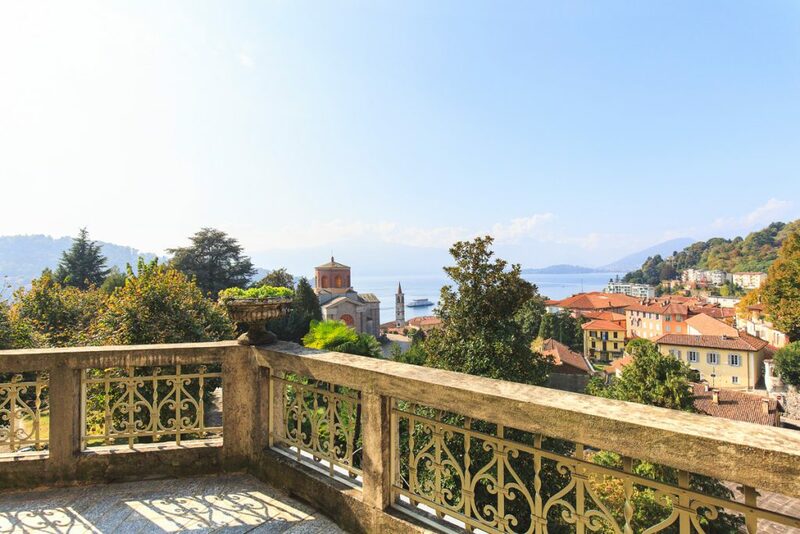 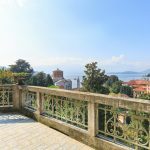 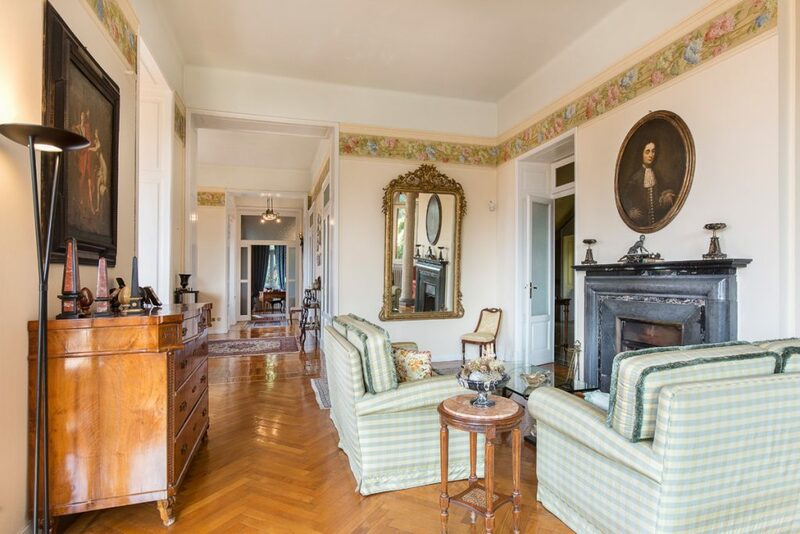 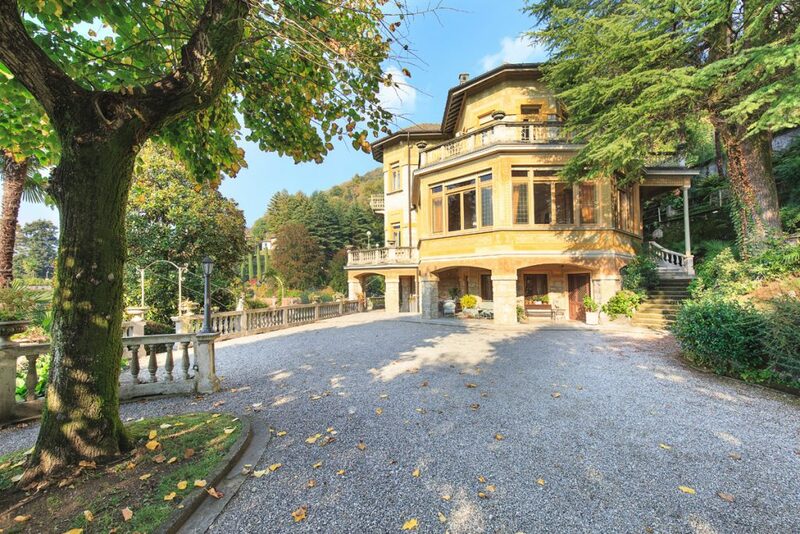 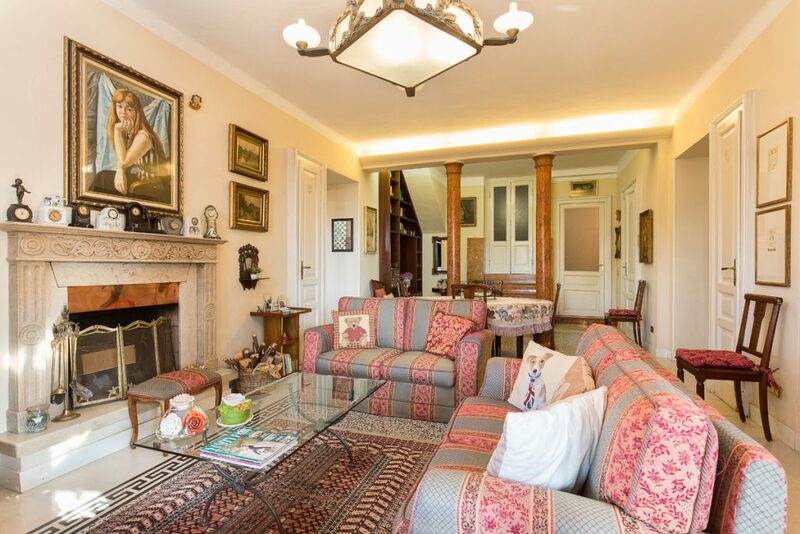 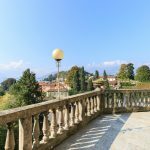 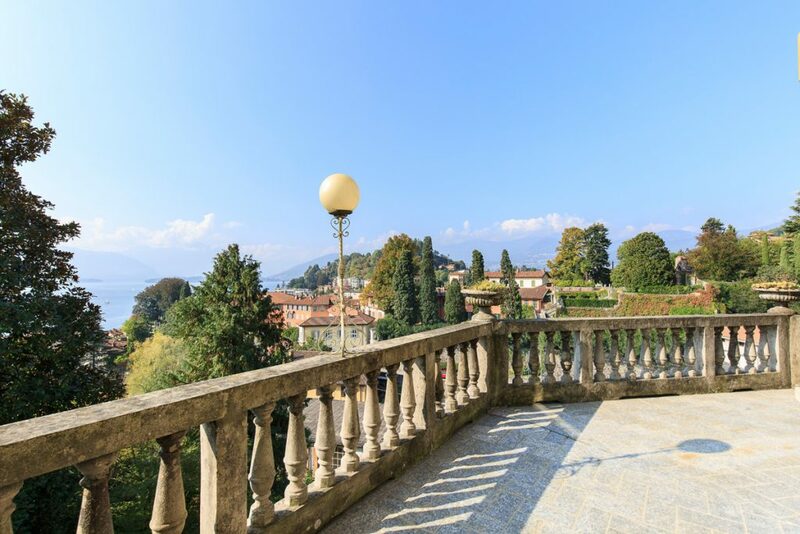 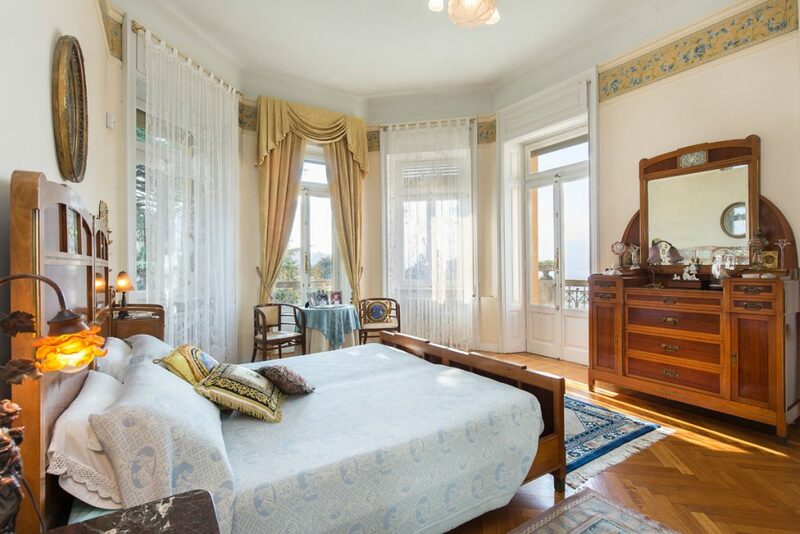 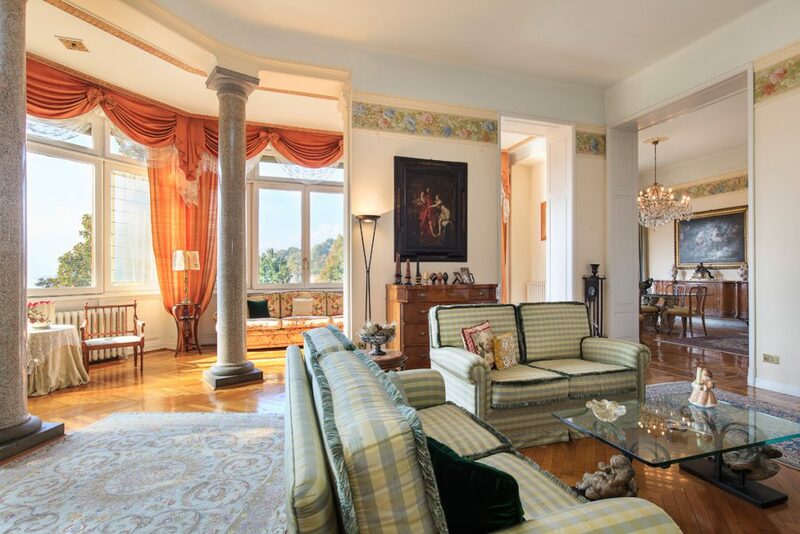 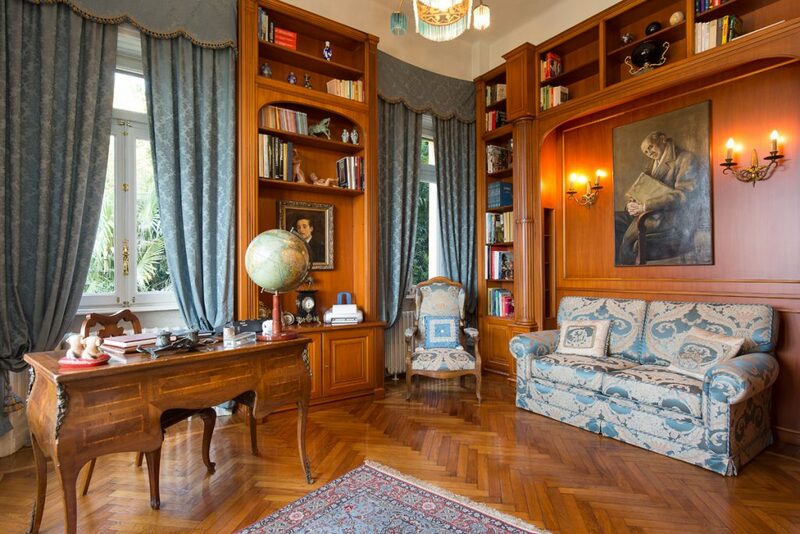 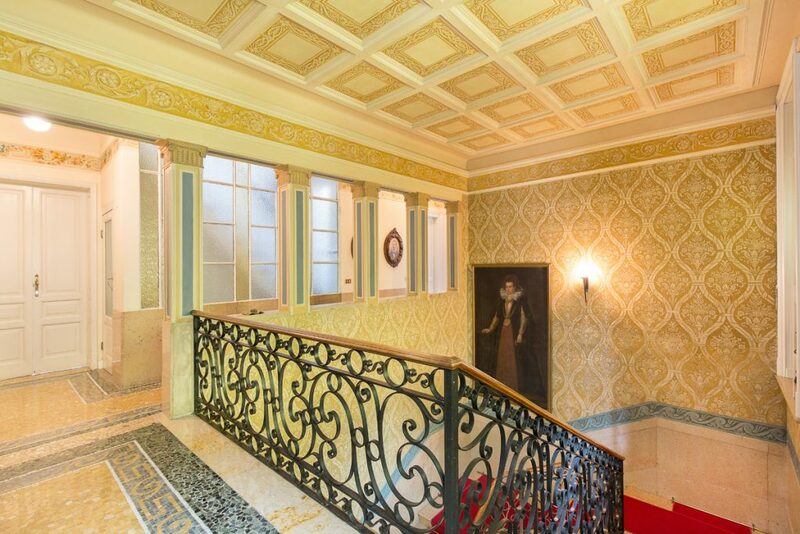 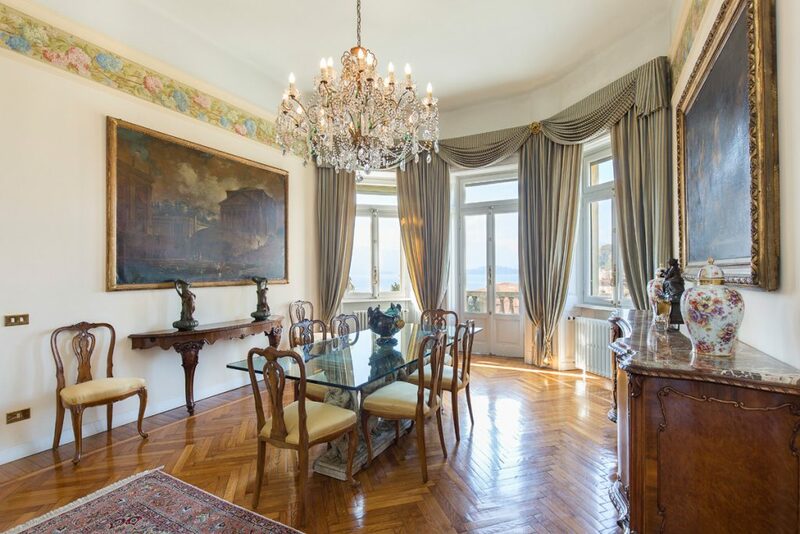 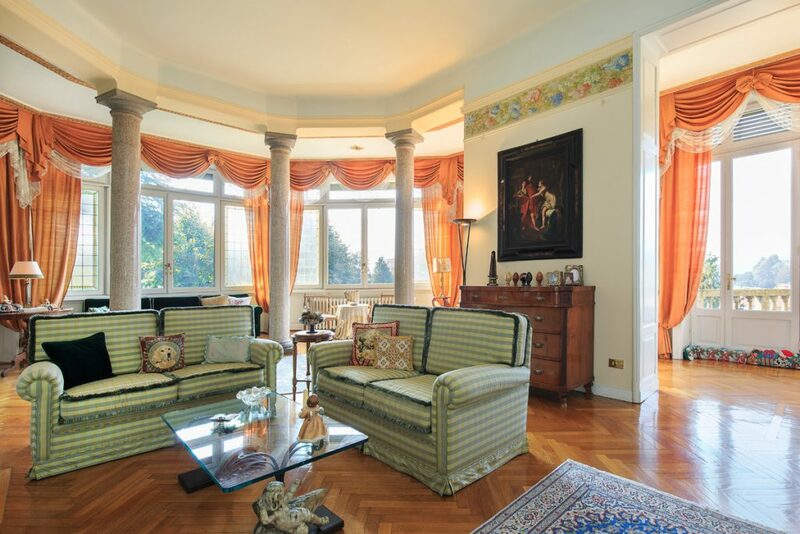 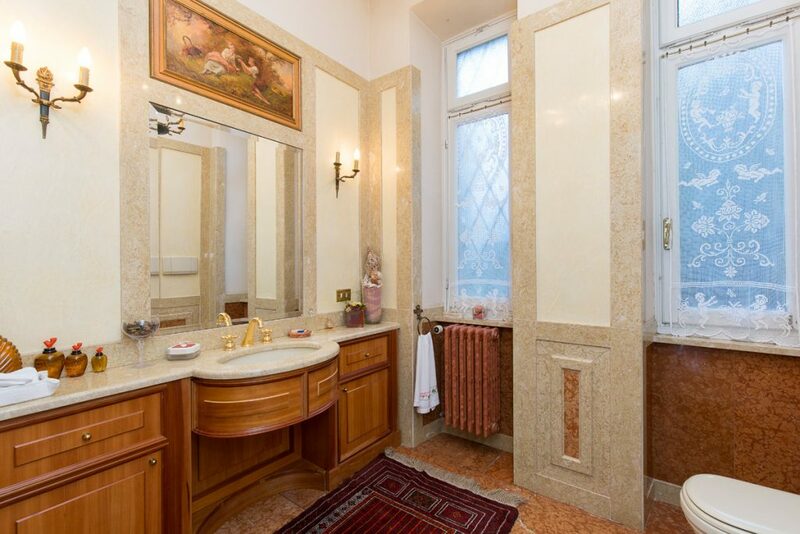 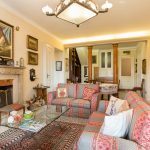 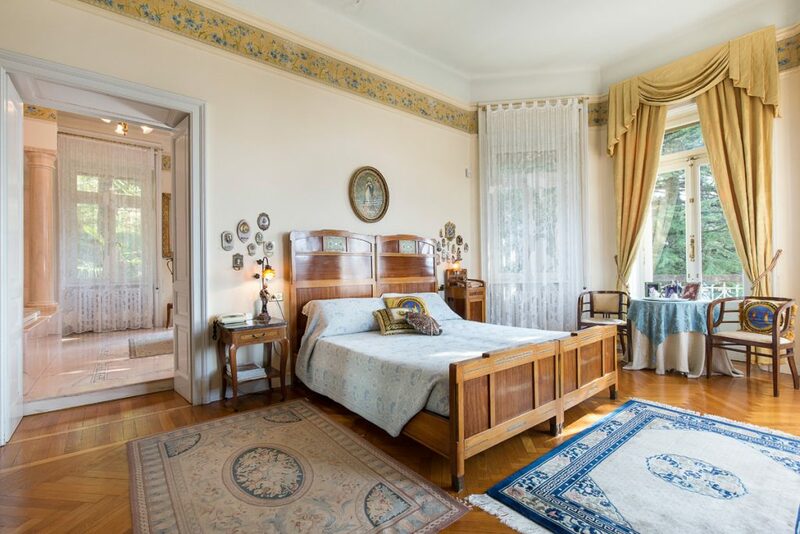 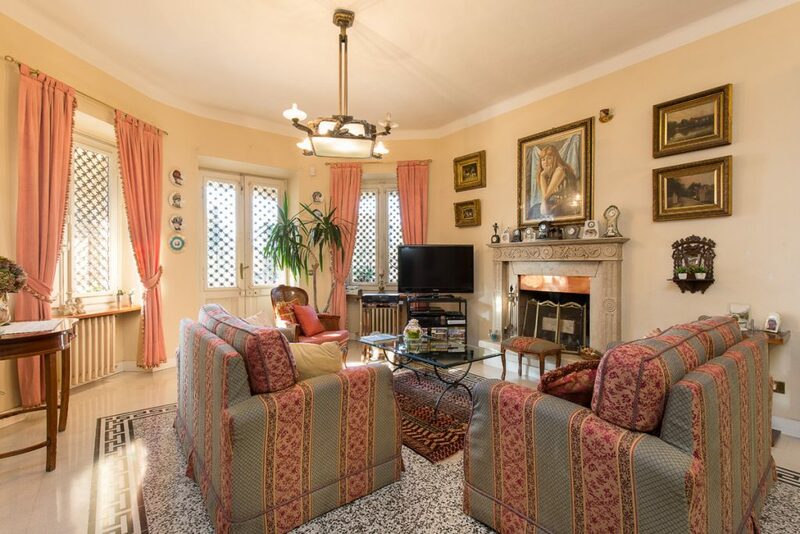 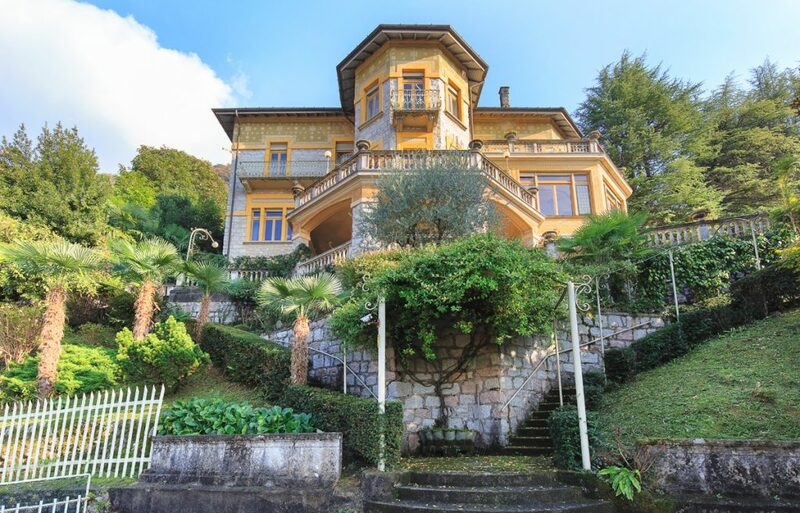 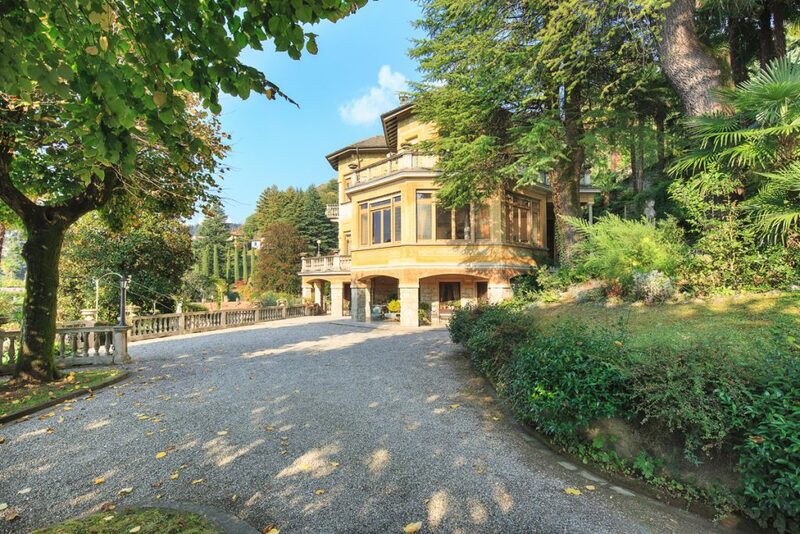 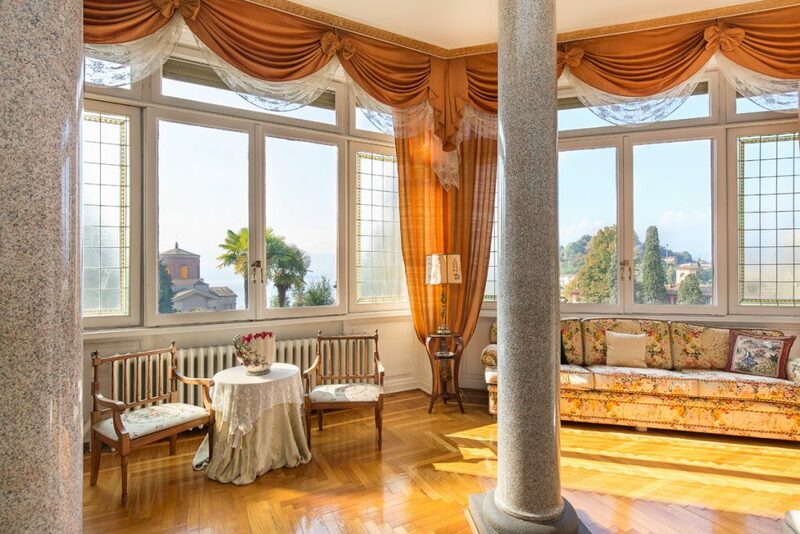 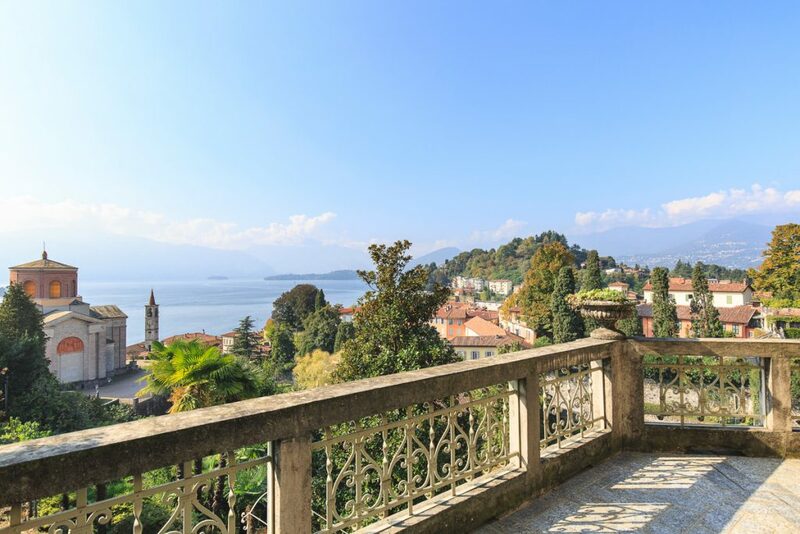 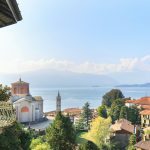 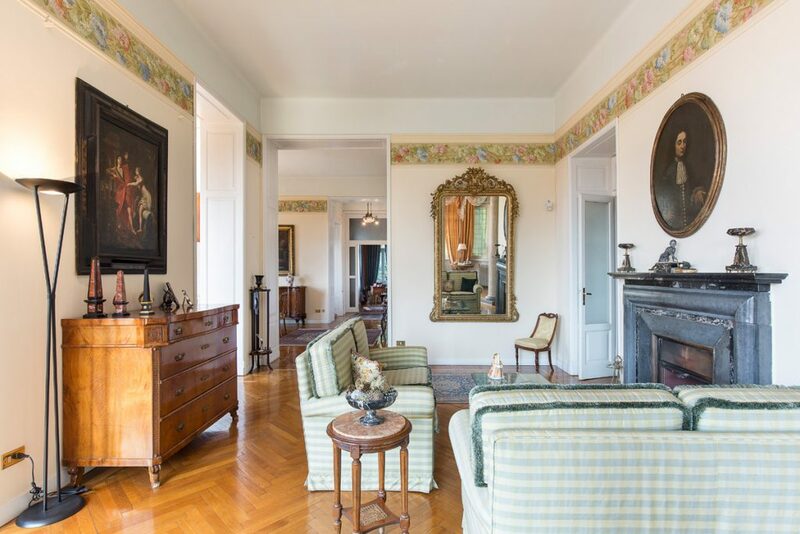 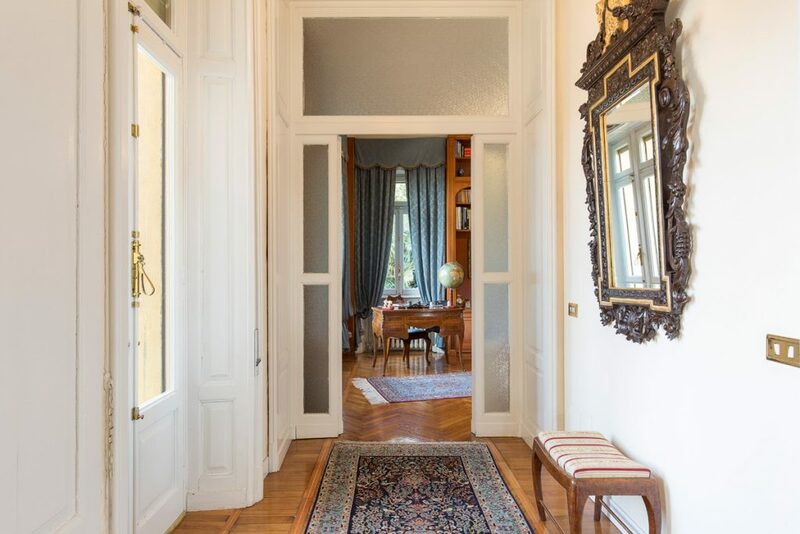 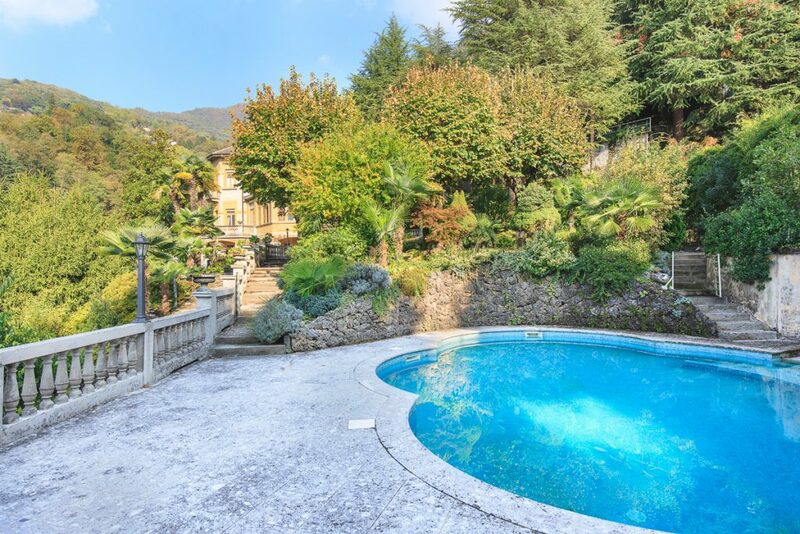 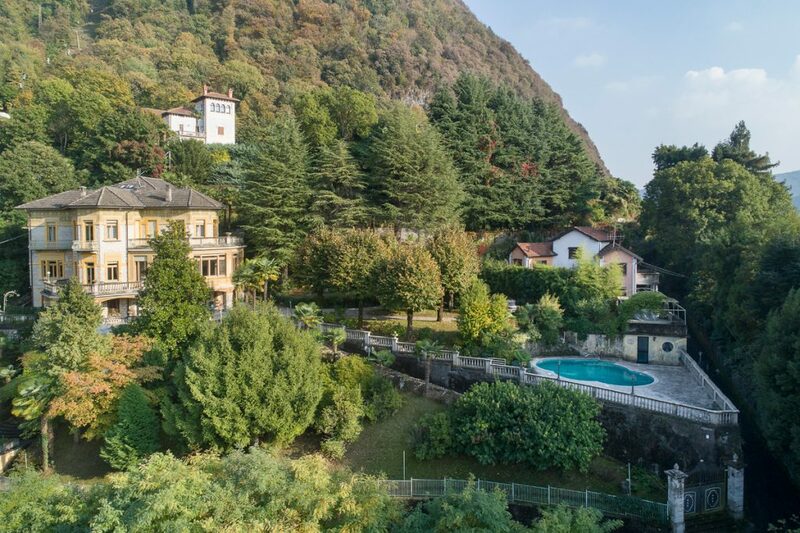 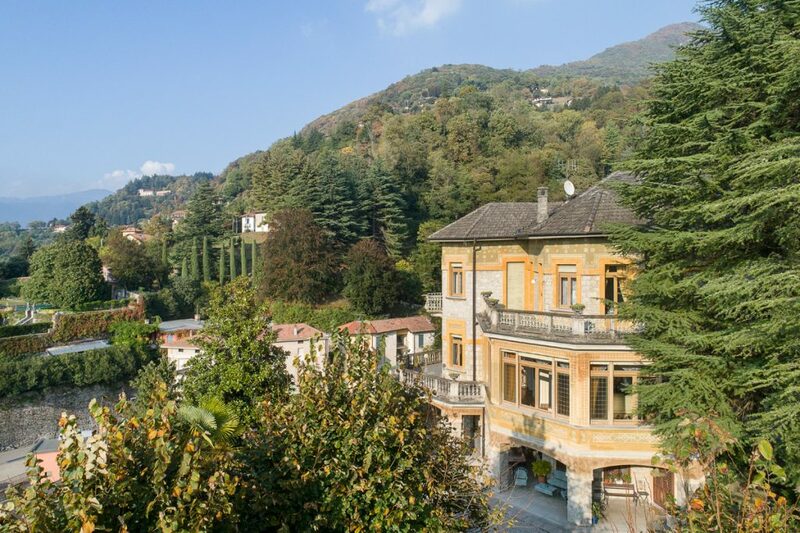 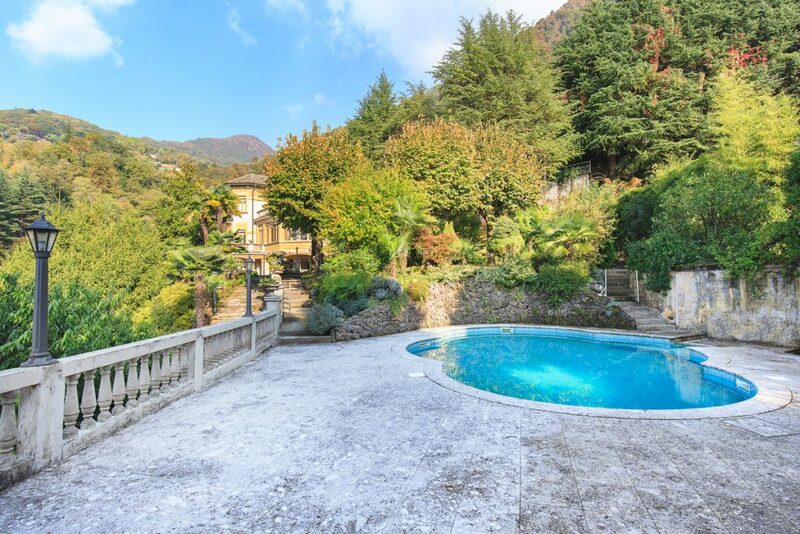 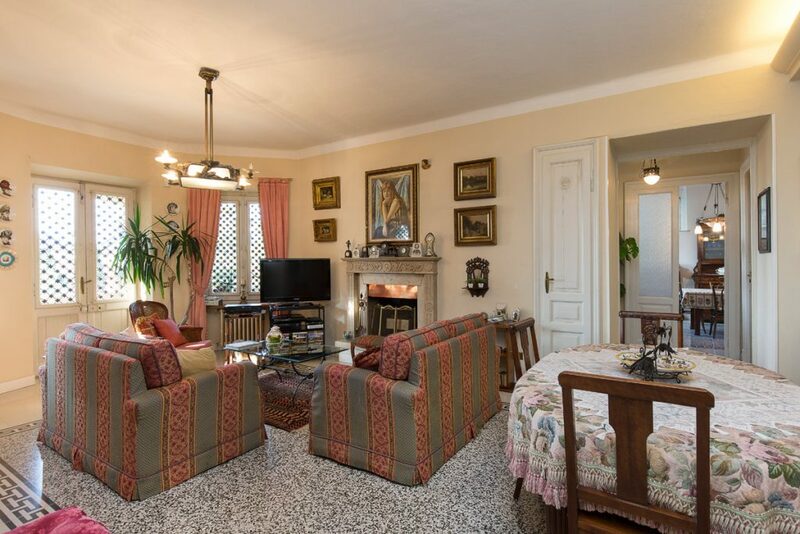 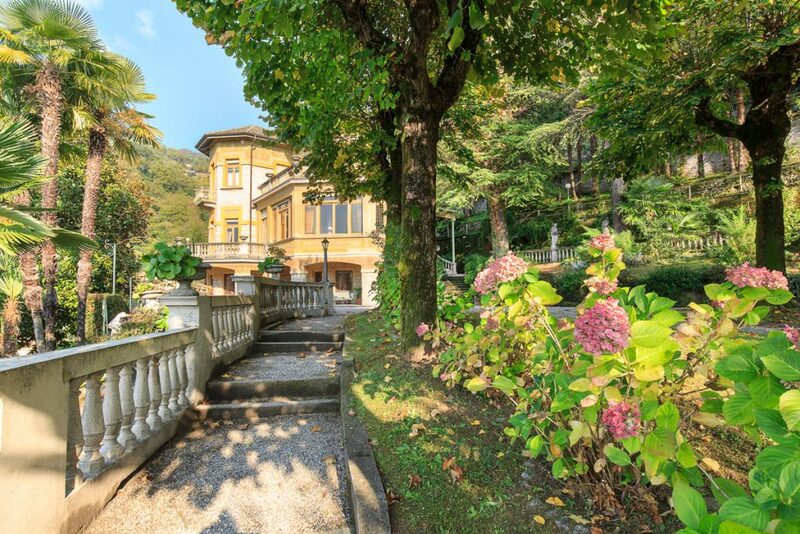 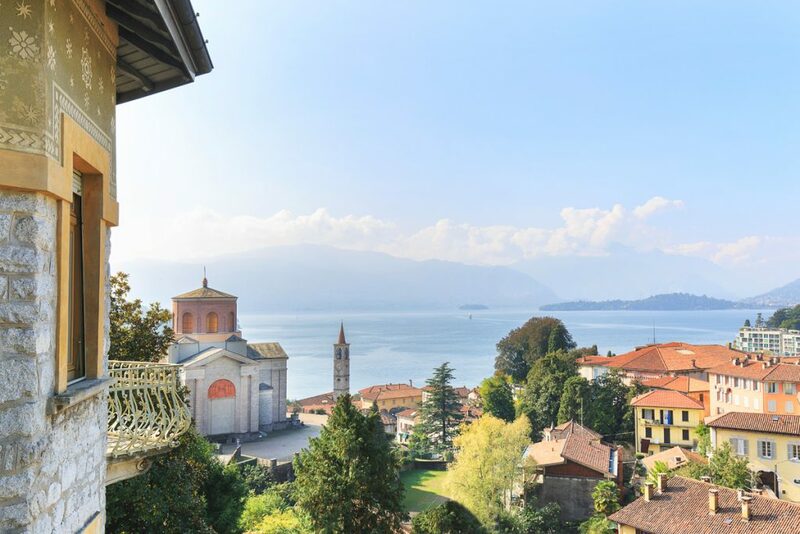 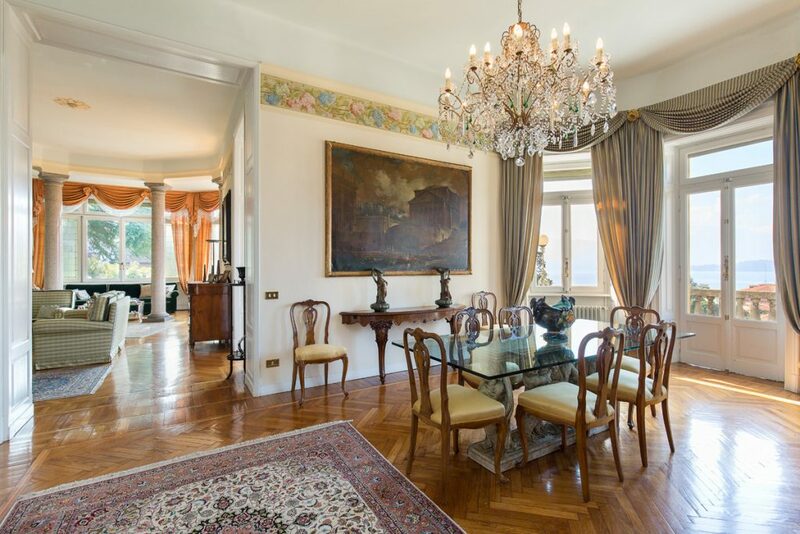 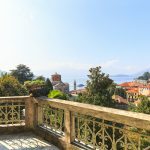 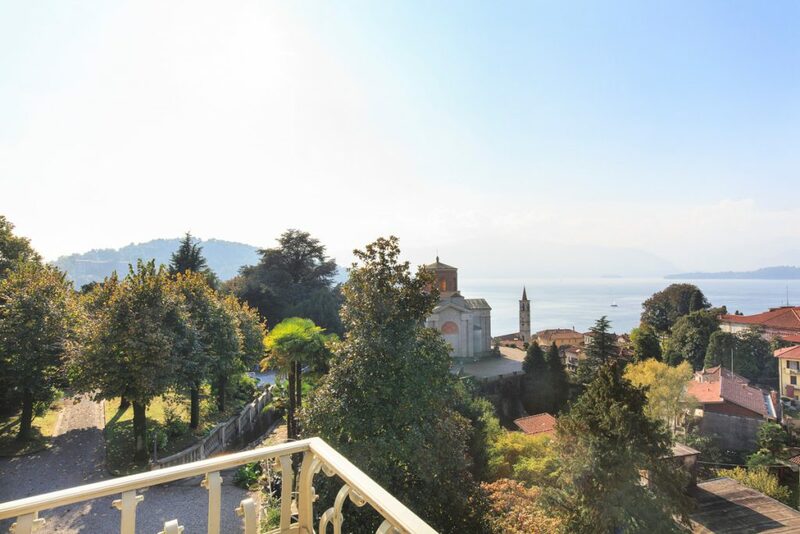 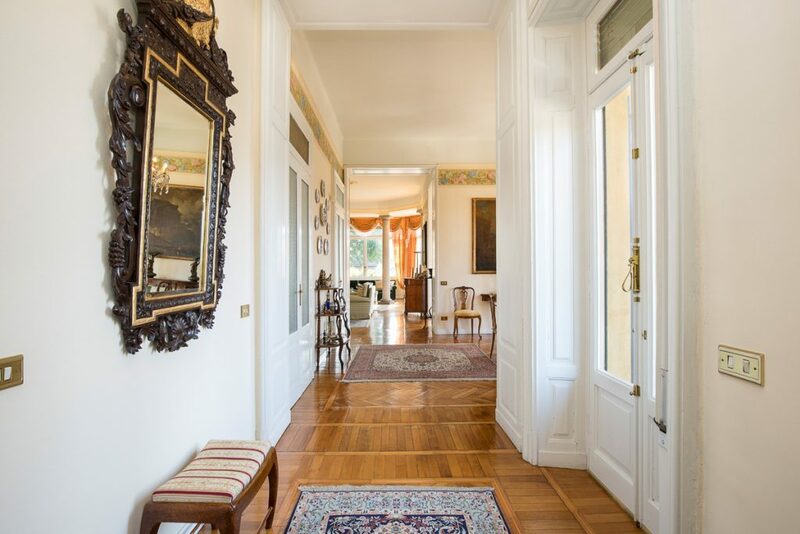 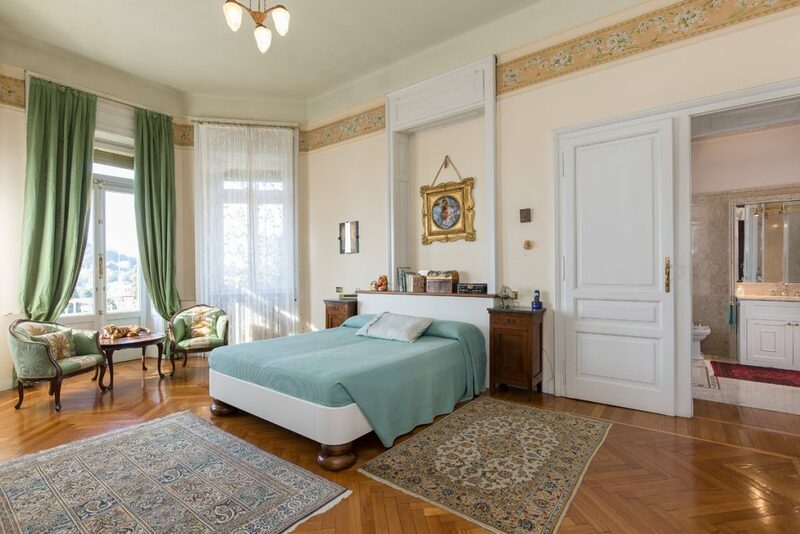 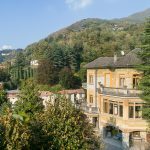 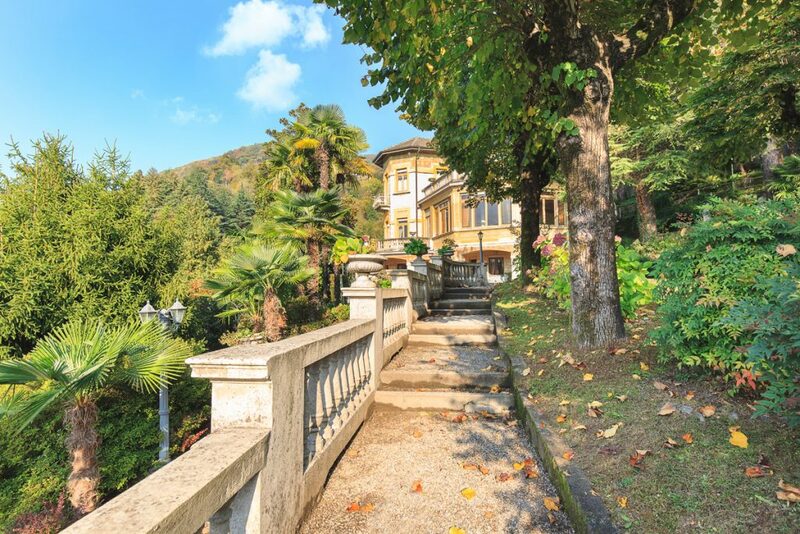 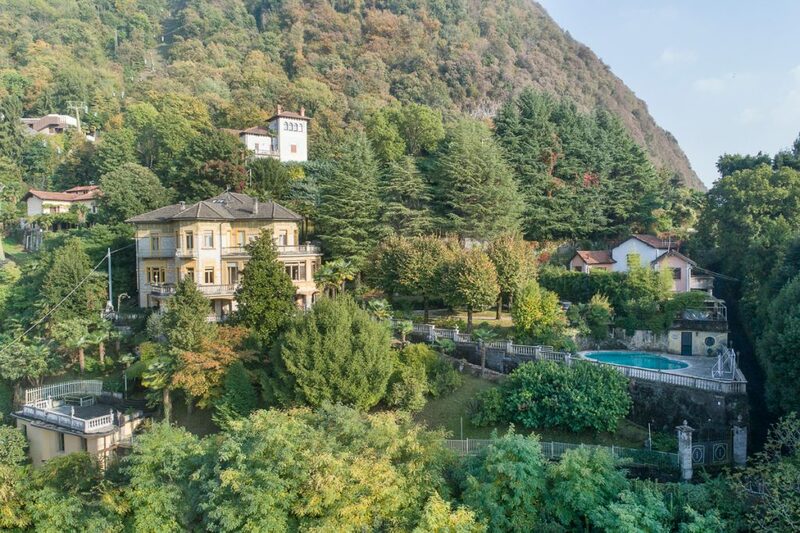 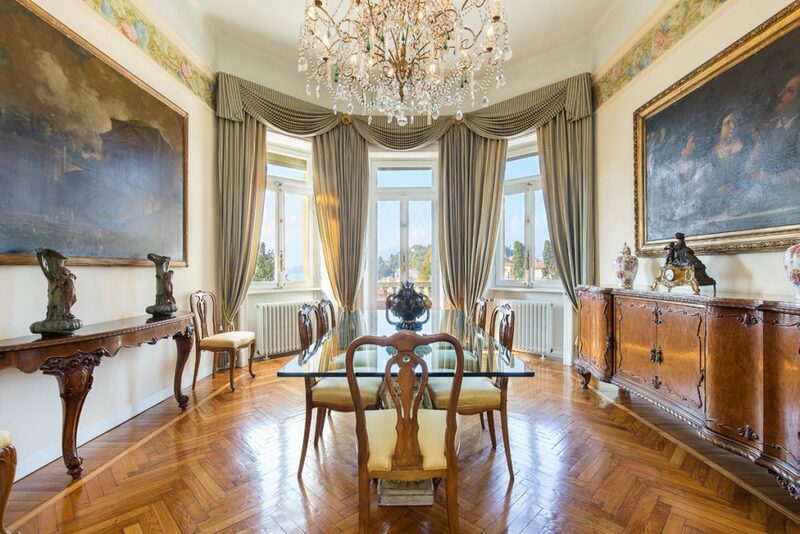 This four-storey period villa with a charming view over Lake Maggiore measures 550 sq. 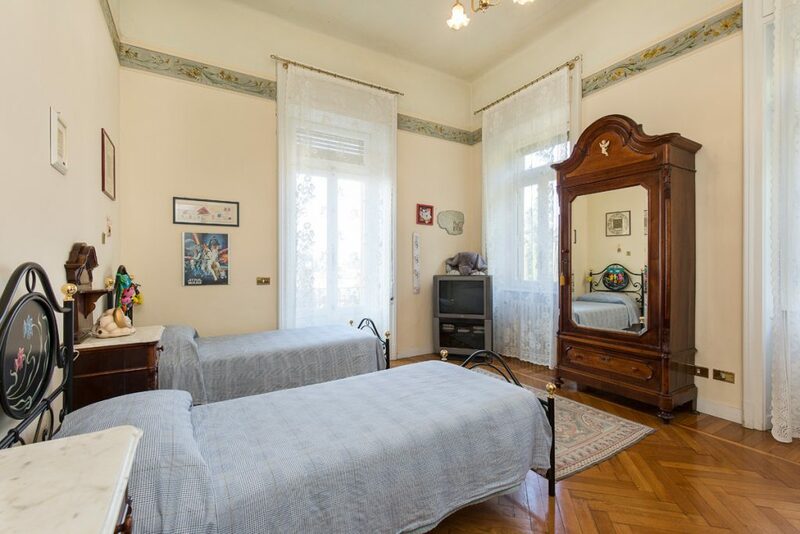 m. overall, PLUS a guesthouse of 160 sq.m. 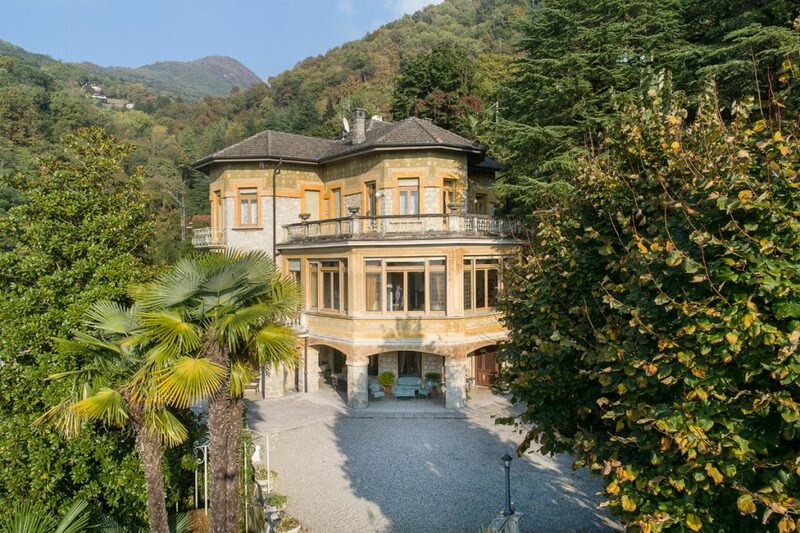 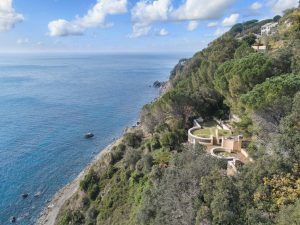 This elegant Villa measures a sprawling 740 sq. 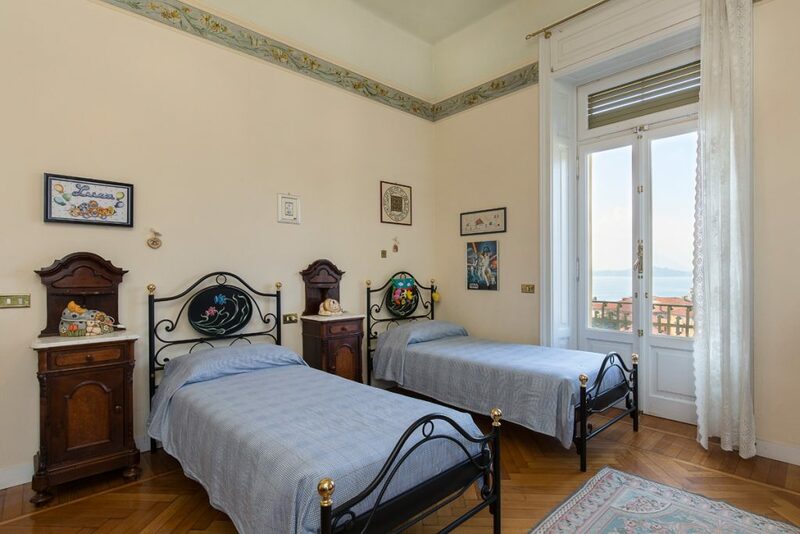 m over three floors in addition to an attic on the last floor; it’s an independent apartment with two bedrooms, a kitchen, and a bathroom. 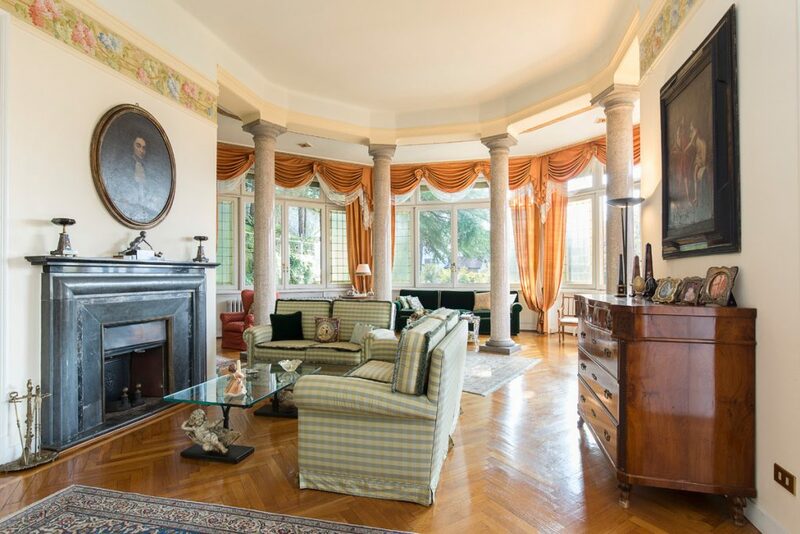 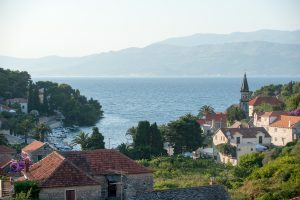 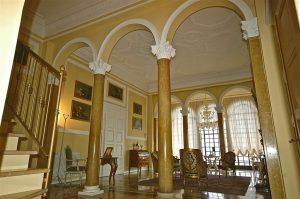 The ground floor features a double-sized hall with marble columns and big windows, a triple living room with parquet floors, an elegant marble fireplace, two kitchens, a hobby room with a billiard table, a laundry room, a bathroom, two utility rooms, a spare room, a studio and terraces overlooking the Lake. 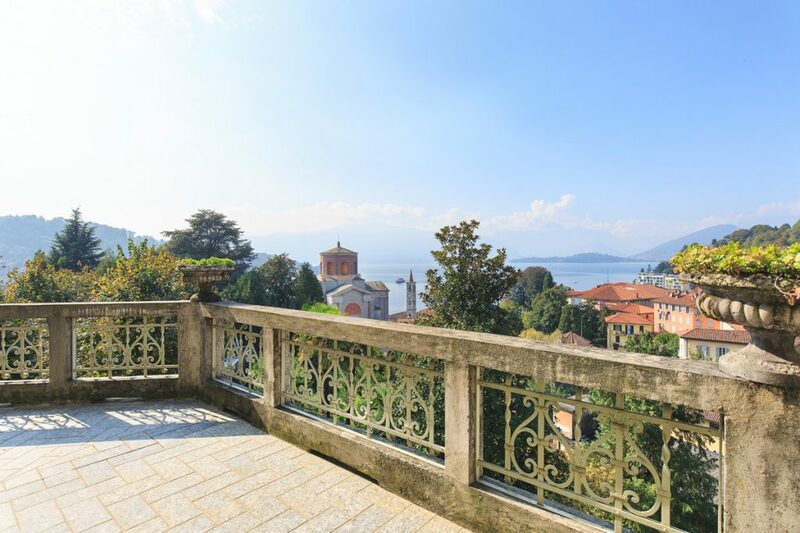 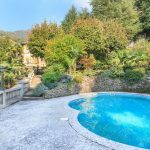 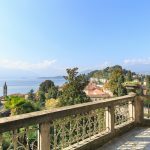 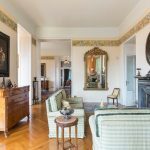 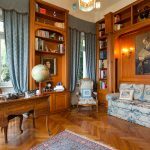 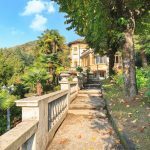 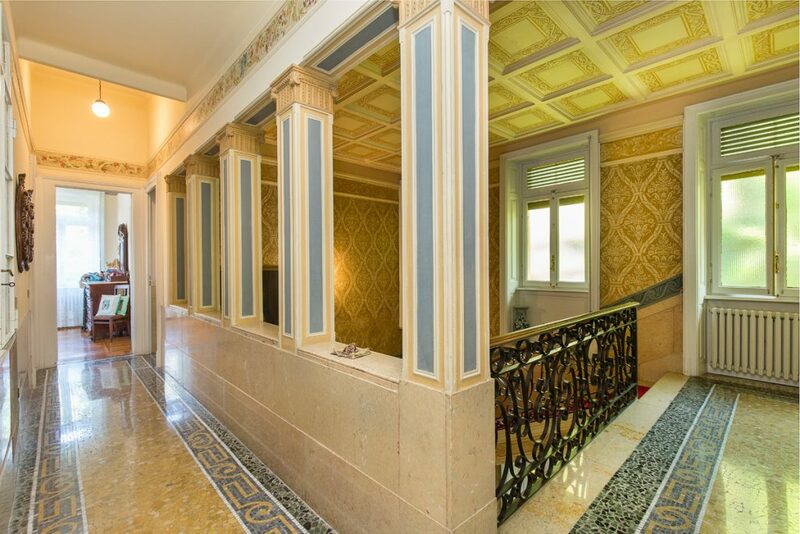 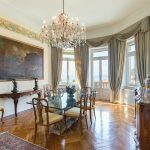 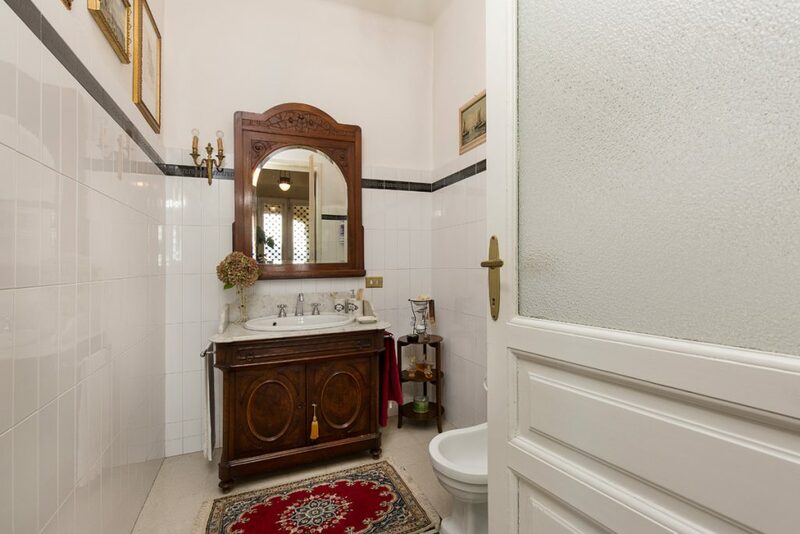 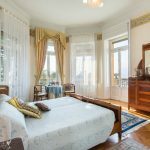 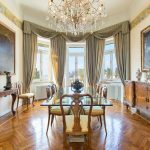 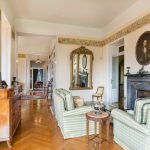 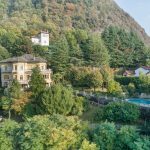 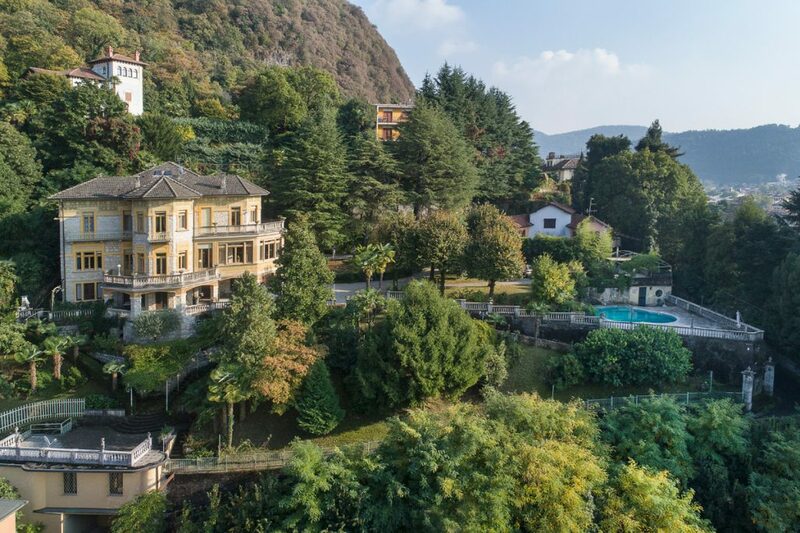 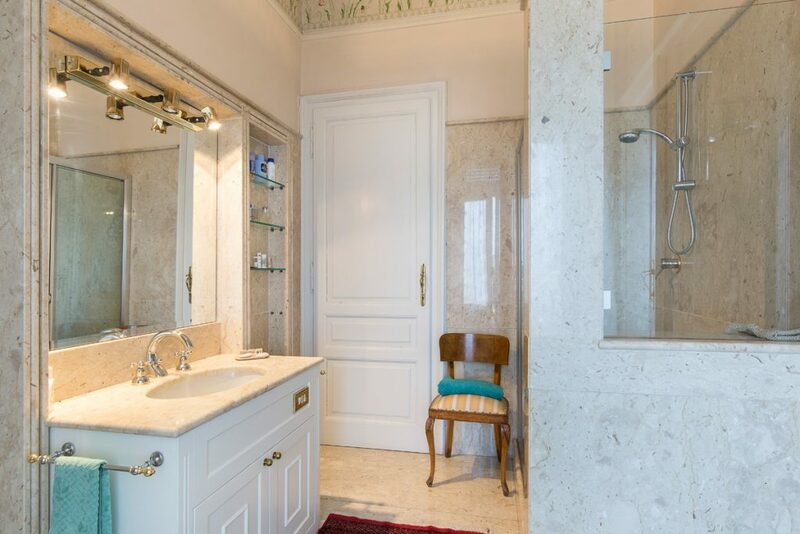 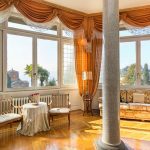 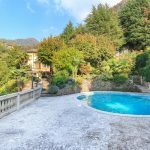 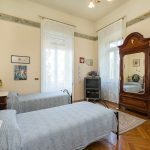 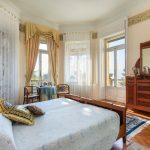 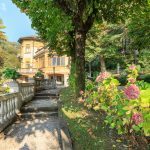 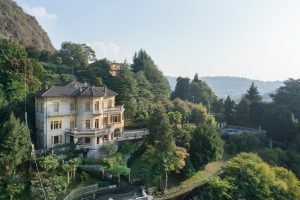 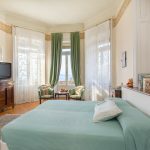 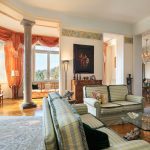 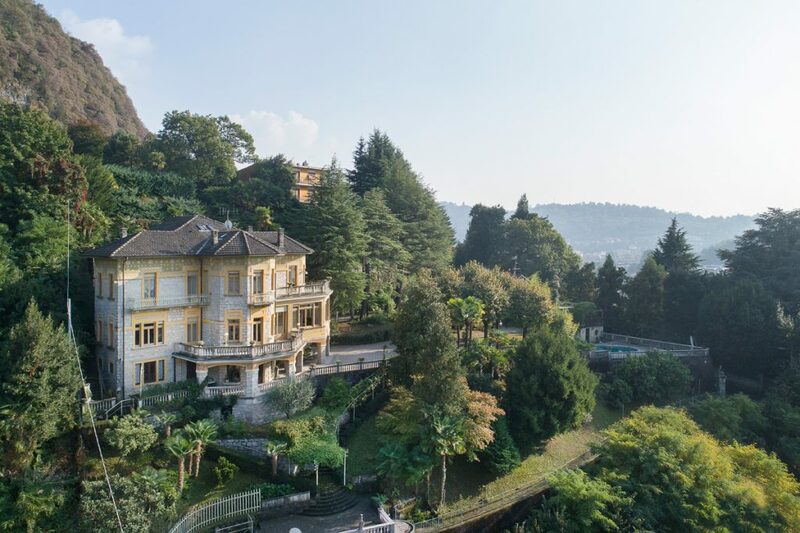 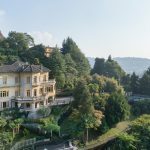 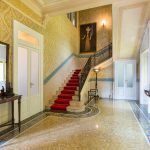 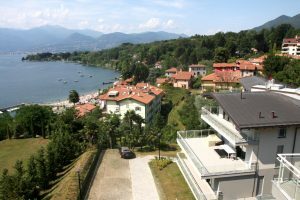 An attractive marble staircase leads up to the second floor where there is the sleeping area consisting of three en-suite master bedrooms with terrace running along the building and offering a stunning view of the shores of Lake Maggiore and surrounding mountains. 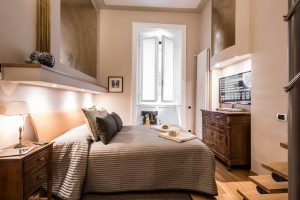 The top floor features two bedrooms. 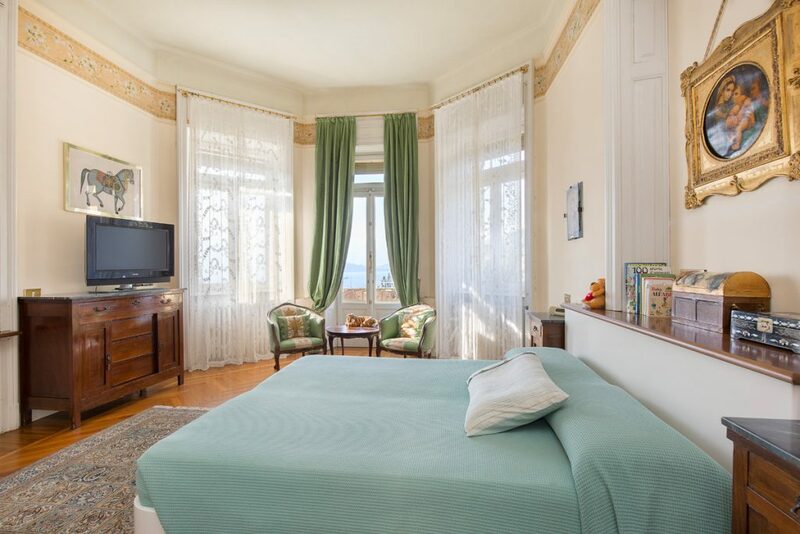 The guesthouse is divided into two apartments each of which has a living room, a kitchen, two bedrooms and a bathroom. 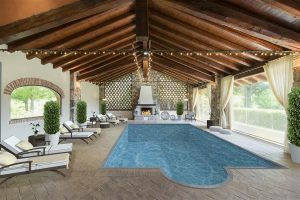 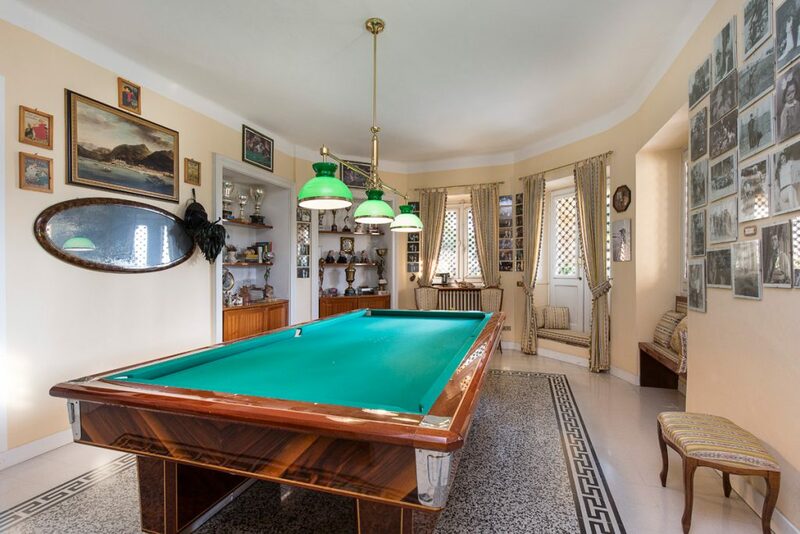 The villa also comes with a porter’s lodge, a garage, a swimming pool and a garden of 3.350 sq.m. 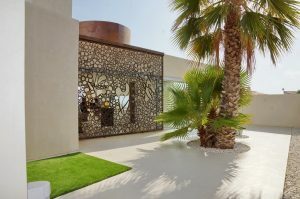 Main Villa: 550 sq.m. 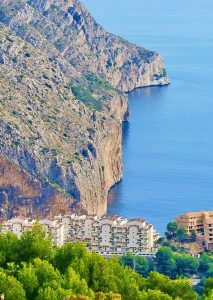 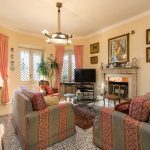 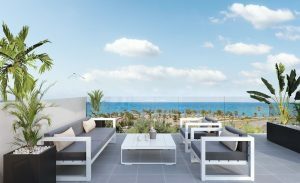 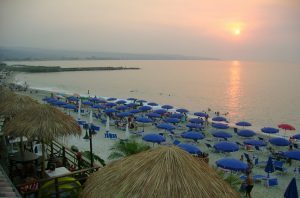 – Terraces 60 sq.m. 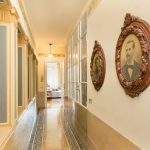 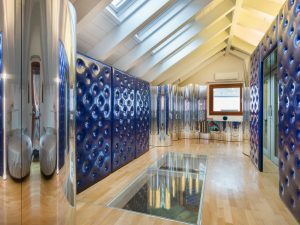 – Portico 40 sq.m. 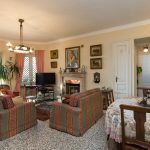 Guest house: 160 sq.m. 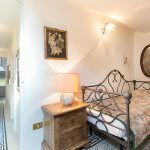 – Porter’s lodge: 45 sq.m. 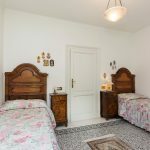 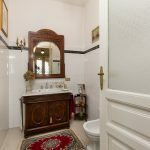 PLUS Guest house: 160 sq.m.